It’s that time of year! We found a fun article in the Capital Star, a publication by the Capital Area Dental Society. We hope you enjoy it as much as we did! “For as long as I’ve been editor of this prestigious newsletter/journal, I’ve wanted to write something more lighthearted, and mainly out of my own curiosity. October brings out the ghosts and goblins, so no better time for us to bring out a mythical creature of our own: The Tooth Fairy. Who is she (forgive the assumption that she’s a she) and where does she come from? Is she old and does she work alone like St. Nick, or is “she” really an elite team of young energetic fairies that takes to the sky each night? All questions you are likely to be asked by a young child, as you are a leading authority on lost baby teeth, so you’d better be prepared! Much like the newish Elf on a Shelf phenomenon, we can thank our American version of the Tooth Fairy on a book. In a 1700s French fairytale, La Bonne Petite Souris, a fairy disguised as a mouse helped an enslaved queen by knocking out the evil king’s front teeth and hiding them under his pillow. The tale was translated to English in an illustrated children’s book in the 1920s, and our Fairy was born. But neither our Fairy, or the French mouse version, are truly original ideas. 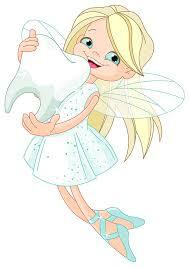 Lost baby tooth customs and myths have been around for centuries (that we know of). Many early customs simply involved burying the teeth. This was done either to help “grow” a new tooth, or to prevent some other creature like a witch from finding the tooth and using it to cast a spell on the child. Everything you can imagine has been documented…throwing it to the sun, throwing it between the legs, throwing it onto the roof, eating it, having mother eat it, placed in a hole in a tree, etc. Besides the fairy however, the tooth mouse is one of the most common agents (remember our mouse-fairy from France…not an original idea). Anthropologists have speculated that the use of a mouse or other rodent as the intruder was because of the mouse’s strong teeth, that ironically never fall out. Spain, most Latin American countries, France, England, Belgium, Switzerland, Italy, Hungary, Lithuania, Belarus, and Slovenia all have a custom involving a rodent of some species. Asian countries throw the lost tooth either onto the roof or under the floor, with differing variations on where to throw the tooth depending on which jaw it came from. Many of these customs, however, still involve asking a mythical mouse for the blessing of a new tooth.